When preconversion or postconversion scripts are available to CES (see Adding a Preconversion Script and Adding a Postconversion Script), you can apply a conversion script to every documents of a specific source. Only one preconversion script and one postconversion script can be applied per source. You can execute the conversion script on every document of every index source (see Applying a Global Conversion Script). CES 7.0.6424+ (February 2014) Once a preconversion, postconversion, or custom converter script (.NET, JScript, or VBScript) is applied to a source, you can modify and save the script file on the fly and it will be immediately and automatically reloaded and applied, even on an ongoing incremental refresh, full refresh, or rebuild of the source. CES 7.0.6607+ (April 2014) An entry in the CES Console and logs identifies preconversion and postconversion scripts applied during a rebuild, full refresh, or incremental refresh of a source. These log entries can be useful to help troubleshoot source issues caused by conversion scripts. Example: The following log entry shows that the MyPreconversionScript and MyPostconversionScript scripts were applied to the rebuild of the source FileShare1. In the Collections section, select the collection that contains the source to which you want to apply a conversion script. 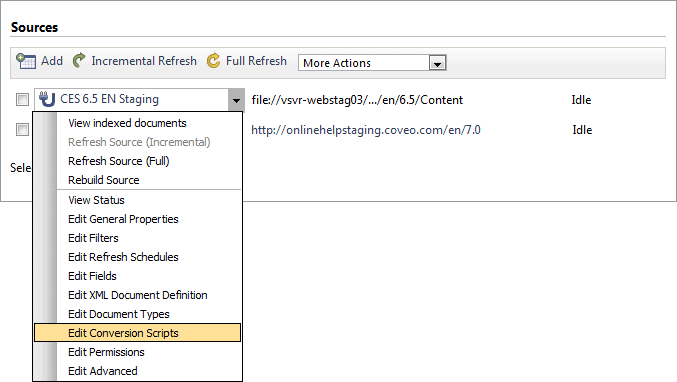 In the Sources section, expand the appropriate source drop-down list, and then select Edit Conversion Script. 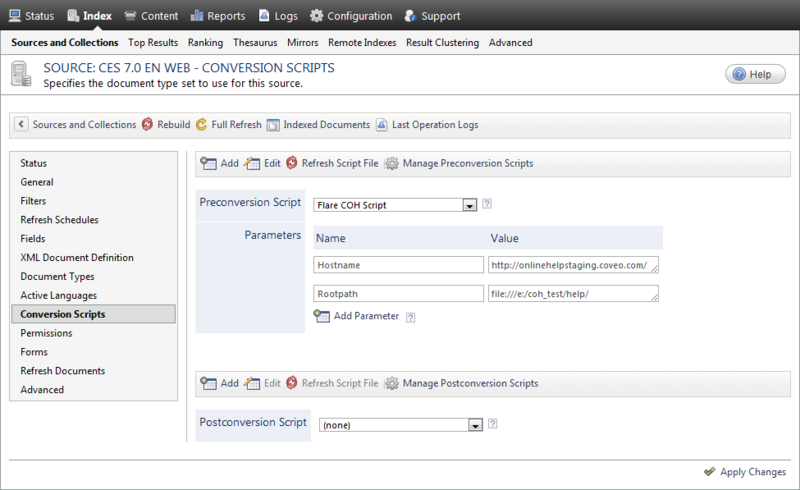 In the Preconversion Scripts or Postconversion Scripts drop-down list, select the appropriate script. Note: A script appears in the appropriate drop-down list only after being added to CES (see Adding a Preconversion Script and Adding a Postconversion Script). If the preconversion or postconversion script requires other parameters, for each parameter, click Add Parameter in the Parameters section, and then enter the name and value of the parameter. Click Apply Changes. Note that it is possible to set parameters to scripts. CES 7.0.9434+ (September 2018) Once you apply the script to a source, on the script page, the source name will appear next to Used By.